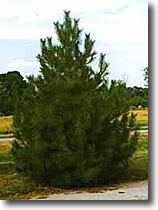 Austrian Pine feature very long, dark green needles and can reach a height of up to well over 60 feet, with a spread of up to 40 feet. It is one of the hardiest of evergreens, able to thrive in occasionally very dry conditions and slightly alkaline soils, uncommon for an evergreen. Austrian Pine are fast growing and amazingly adaptive, tolerant of wind, temperatures of 20 below zero, road salt, air pollution, drought and hot weather. Although officially rated to grow as far south as zone 7, they can often be successfully grown into zone 8 once properly established. They thrive in full sun, but also do well in partial shade, and grow in sandy, well-drained soils as well as heavy clay. However, when first planted this species needs water just as much as any other.